My oldest daughter just graduated from high school, just went to her senior prom, just started her first summer job. This fall, she’ll be going away to university. I couldn’t be prouder of her. She has excelled academically and, more importantly, has developed into a kind, conscientious young women who I’m proud to send out into the world. My sweet daughter loved these coffee cake muffins – both of my sweet daughters loved them! Make them for the people you love. Preheat oven to 375 degrees. Butter or spray a standard 12 cup muffin tin. To prepare the filling, whisk together the brown sugar and cinnamon. Set aside. To prepare the dough, in a separate small bowl, lightly beat together the buttermilk and egg. Set aside. In a large mixing bowl, combine the orange zest, brown sugar, baking soda, salt and vanilla. Whisk to combine. Add the buttermilk/egg mixture and, using a fork, mix everything together. Add the flour and mix the ingredients with a wooden spoon or spatula. Do not overmix. With a pastry brush, coat the entire surface with the melted butter. Sprinkle with the brown sugar/cinnamon mixture, and gently press it into the dough. Starting on the long side, begin rolling the dough into a tight log. If the ends are scraggly, cut them off. Cut the log into two equal pieces, then cut each of those into two pieces. Finally, cut each of these sections into three, for a total of 12 muffins. Place each one into the prepared pan, and bake for 13 – 15 minutes or until golden brown. Remove from the oven and let the muffins rest in the pan for about 5 minutes. Remove from pan and let cool completely before adding the drizzle. For the drizzle, combine confectioners’ sugar, cinnamon and 2 Tbsp cream in a small mixing bowl until smooth. If it looks too thick, add a little more cream until thin enough to glaze. Drizzle mixture over the muffins to decorate. I'm so happy that your girls enjoyed the muffins! CONGRATULATIONS, sweetie!! May life always show you its sweet side. My girls are still young but I know that they'll be off to college before I know it. Beautiful photos! congratulations to both you and your daughter for these achievements. A wonderful time of growth and change, which I can well remember from my experience with my daughter, not too long ago. 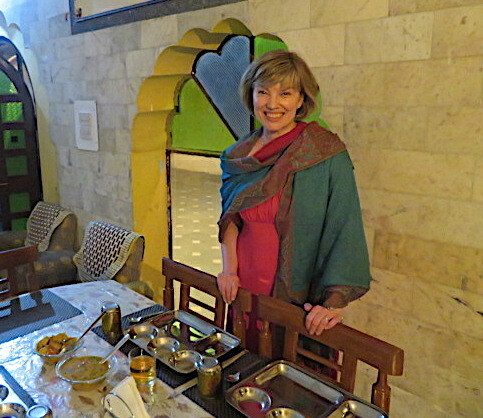 Now married, she is expecting her first child in December–I am looking forward to grandparenthood! Congrats to your daughter! She's lovely! I have so many of your recipes bookmarked – now that summer is here, I hope to actually try a few of them! Congratulations to you, too, Nancy! That's definitely something to look forward to! And Jemi, I hope you enjoy some of those recipes. Let me know! Congrats on your daughter graduating. Hopefully in the Fall you'll show us how to gracefully let go. I'm a few years behind you and then my only daughter (and child) will be going to college. Congratulations to your daughter! What an exciting time for both of you! These muffins look irresistible too. That is so sweet! Congratulations! I wish your daughter all the best on her new journey of life! What can I say? Just a sweet post. Congrats to your daughter for what she's accomplished (and is about to accomplish), and congrats to you for creating the environment where such accomplishment was possible. She has so many new opportunities now! Congratulations to your daughter! She has so many things going for herself. This is an exciting time as she explores adulthood. What a sweet post and congrats to your daughter for all of these achievements! The muffins look delicious and beyond. That's a great accomplishment and truly the start of something totally new! I wish her the very best. And, um, those muffins look amazing! Beautiful daughters and a yummy treat–life doesn't get much better! Congratulations to your daughter! What an exciting time in her life 🙂 these muffins are simply divine! This is such a sweet treat for such a sweet time in life, I love it! Wow, I can't believe your daughter is getting ready for university. My niece started last year. Geez where does the time go????? Your daughter is beautiful! Such a fun time in her life! The cinnamon rolls look amazing which I could reach in for a bite. What a lovely post Beth. Wishing your daughter every success with all of her firsts. And thinking of your younger daughter, as this is a time of transition for her too! 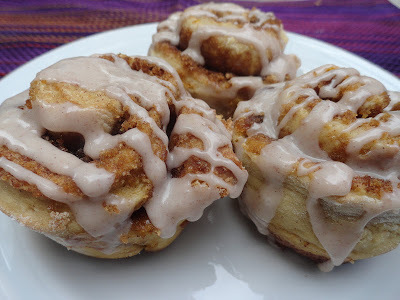 I must make these cinnamon roll muffins for my sweet girls. That is such a beautiful photo of you and your daughter, Beth. I wish your much happiness and success. Your cinnamon rolls look perfect and I will have to make them for my loved ones. Your daughter is stunning, congrats to both of you on this milestone! Your daughter looks so PRETTY! Like mother, like daughter! These cinnamon rolls are fantastic. Congratulations for your daughter Beth! Kids grow so fast you don't even realize it! The cinnamon rolls is something I love too! Congratulations to your daughter–how wonderful, and yes, a huge step in her life! Have you ever seen the show "Parenthood"? It uses that song as its introduction. Best wishes to your beautiful daughter! A most lovely photo of the two of you 🙂 I think the cinnamon rolls look pretty special too! It must be exciting to watch your daughter start a new phase in her life. Congratulations to her! And, these muffins look amazing. A great thing to share with family and friends. I haven't seen that movie, Lorraine. I just loved these lyrics! she is so beautiful just like her mother. Congrats! These rolls look scrumptious. Lovely recipe, and even lovelier daughter…so grown up, how can that be? Such an exciting time. Matt went off to college last year and I wasn't sure how I was going to do, but it was fun and we had a lot of great times over the year with the college activities, etc. Each new phase is just such a great time…enjoy enjoy with your college daughter this year! Congratulations to your daughter!! Such lovely sentiments! And absolutely wonderful looking sweet rolls! Lovely post! 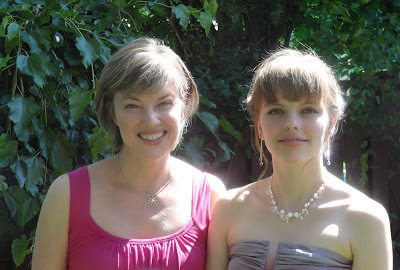 Love the photo of you and your daughter….she looks so much like you! Dear Beth, Congratulations to you and your daughter. It is hard to believe how time flies, but I couldn't be more proud of my own two kids. I understand your pride. Your daughter is absolutely beautiful and I wish her all the best. You've shared such lovely thoughts. Congrats to your daughter Beth! She is a beautiful young woman; you raised her well. 🙂 These coffee cake muffins look like a perfect celebration of her accomplishments. Very lovely post (and delicious looking muffins, too)! "Oh my goodness." *giggle* "You should make those, Mommy. Those look delicious!" PS Best of luck to your daughter! Oh my goodness, you both look so beautiful in this picture. You have ever reason to be proud, Beth!